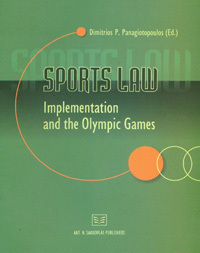 25-27 November, Athens, 2004, "Sports law Implementation and the Olympic Games". Organised by The International Association of Sports Law (iasl) and the Hellenic Center of Research on Sports law (h.c.r.s.l. ), with The co-operation of The National and Capodistrian University of Athens.